A meeting between the two biggest sides in Spain can never be entirely meaningless, but this is about as close as it will ever get. Barcelona wrapped up their 25th La Liga crown last weekend, with a Lionel Messi hat trick in a 4-2 win at Deportivo La Coruna. Madrid have had a disappointing league campaign by their standards. However, having both secured a top four finish and a place in this season’s Champions League final within the last week, Los Blancos are still certainly the envy of all but a few top clubs. So this match is as close to pointless as El Clasico will ever get. 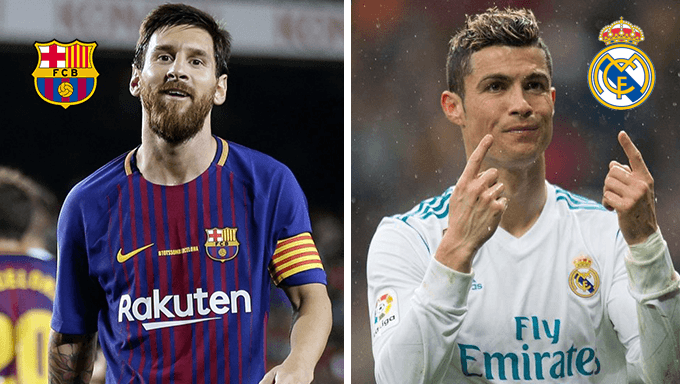 But that won’t matter once the match starts; Barcelona will want to finish the season unbeaten, while Real will aim to lay down a marker ahead of the 2018/19 season. However, with Real likely to be distracted by thoughts of Kiev, the result bet has to be for a Barcelona win. It’s priced at 4/6 with Matchbook, and even though Barca haven’t won any of the last three meetings at Camp Nou, they look likely to on Sunday. Can we expect Real to get on the scoresheet at least? It seems reasonable to assume they will. Sixty-nine percent of their away league matches have seen both teams find the net this season, which is the highest proportion of any team in the Spanish top flight. Zinedine Zidane’s team have also been involved in 49 La Liga matches since the summer of 2016 where both teams scored, which is again a division-wide high. The fly in the ointment might be that Ernesto Valverde’s team have only conceded eight league goals on home turf all season, but Real have scored in their last six league visits to Camp Nou, and their last ten in all competitions. The bet therefore has to be for both teams to score, and that’s available at 2/5 with Sportnation. Barcelona and Real are also both in the league’s top three for games which have featured at least three goals over the past two seasons too. But before we rush in to bet on over 2.5 goals, we have to bear in mind they dish out plenty of thrashings to the lesser sides, which accounts for a healthy chunk of their goal-heavy games. A closer inspection of their results is required. The Blaugrana have played three of Spain’s top six at home already in 2017/18, and there has only been over 2.5 goals once. Real have seen it twice in their away matches against the top sides, and there were some big-scoring matches too. They had a 4-1 win at Valencia, and a 5-3 victory at Real Betis. El Clasico finished 1-1 at Camp Nou last season, but there were at least three goals in the six league meetings in Catalonia prior to that, so it looks wise to bet on over 2.5 goals. You can back that at 4/11 with 888sport. It’s no surprise to see Lionel Messi lead the betting in the scorer markets. The Argentine legend is available at 13/5 with BetBright to open the scoring, or 4/7 to score at any time. Messi is the La Liga top scorer this season, with 32 goals. He has also scored the most at home of any player – 19 – and only Willian Jose of Real Sociedad has scored the opening goal more times than Messi has. There’s also the small matter of his record against Real Madrid; 25 goals in 37 appearances against Barcelona’s greatest foe. He has scored two-or-more goals against them on six occasions, so a bet on that occurring here wouldn’t be the worst idea. Messi is priced at 3.00 with Bet-at-Home to net a brace or better. Just as Barcelona’s talisman is the obvious choice for them, so Cristiano Ronaldo is for Real Madrid. He has statistics which are almost as impressive as those of his great rival. The former Manchester United man has scored 17 times in his 32 games against Barcelona, and has scored five league goals (plus six in cup competitions) at Camp Nou. Only six of his 24 La Liga goals this season have been away from the Bernabeu, but it’s hard to make a case for any other Real player. Ronaldo is 4/3 to score, or 11/2 to grab the opener with 888sport. It doesn’t matter if it doesn’t count for too much on this occasion. You just know this is a match which you do not want to miss.